Decorating for a party or special celebration? 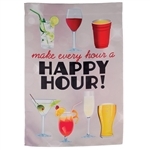 Wind Sensations has decorative flags and party banners to make your theme very special. BEST DAD EVER Decorative Standard Size Flag - 28" x 40"
19th HOLE Garden Flag - 12" x 18"
HAPPY HOUR DRINKS Garden Flag - 12" x 18"
HAPPY HOUR DRINKS Standard Size Flag - 28" x 40"
WELCOME BABY Garden Size Flag - 12" x 18"
WEDDING COUPLE Decorative Flag - Garden 12.5" x 18"
Mom Decorative Flag - Standard 28" x 40"
Mom Decorative Flag - Garden 12" x 18"
Wedding Decorative Flag - Standard 28" x 40"
Wedding Decorative Flag - Garden 12" x 18"
Congrats Grad Decorative Flag - Standard 28" x 40"
Congrats Grad Decorative Flag - Garden 12" x 18"
Mom's Day Decorative Flag - Standard 28" x 40"
Mom's Day Decorative Flag - Garden 12" x 18"
Mint Julep Applique Flag - Garden 12" x 18"
Party Balloons Applique Flag Garden 12" x 18"
Party Time Ya'll Decorative Garden Flag - 12" x 18"